This is one dream that I didn't tell anyone until a few months ago when I made a list of 40 things I wanted to do before I am 40. Since then, people have been curious as to why I wanted to learn how to fence. I only have two reasons: first, because I think the sport is graceful and second because of the kit. Yes, I am shallow that way. Honestly, I really didn't know anything about the sport until I saw Richard Gomez fencing on national television in the '90s. Since then, I held onto the dream that one day I'll be able to fence. And so when I came across a fencing lesson on Groupon, I didn't think twice. £25 for 4 weeks was a bargain I thought. And although I waited for at least two months to start the course, it was well worth the wait. The course took place at Fighting Fit Fencing in Caledonian Road. The venue is not that hard to find as it is only about 2 minutes walk from the Caledonian Road tube station. On my first day, I was quite nervous. First of all, I didn't know anyone. And secondly, I have never played with a sword before, not even as a child. Luckily, a guy called Jed was very accommodating he made me feel comfortable as soon as I entered the door. Anyway, I was really glad that I was actually able to fence on the first night. In fact, I got really excited that I immediately asked someone to take a photo of me pretending to fight with one of my fencing classmates, Luigi. Yes this was after just one go at fencing. Call me keen. Four weeks went by pretty quick though. On our last night, we had the chance to be in competition with the rest of the group. By this time, we have learned enough of the basic techniques in fencing. And although there were only a few of us in the room and that we were competing amongst ourselves, I was really nervous. And of course the day before, I ran the Cardiff Half Marathon and therefore my legs were so sore. I actually had second thoughts of going but I was feeling competitive and wanted to win so I went anyway. We were actually put in pairs. So all in all there were 4 pairs. I must admit that my classmates were far better than I was. And although I went there aiming for the win, my fencing partner Luigi and I only came second. Not bad I suppose, considering that I was sort of disabled that night. So after four weeks of basic fencing, I can apparently call myself a fencer. Well, according to our coach Jed anyway. Yes that friendly guy at the reception was indeed our coach and the owner of the club. And by the way, I am a foiler as I use the foil. There are two other weapons namely sabre and epee. I am glad that I did my first ever fencing class at Fighting Fit Fencing. The atmosphere was really friendly and no one really made me feel intimidated. Jed and the rest of the group made my experience really fun and unforgettable. I went there with very little knowledge of the sport and came out confident that I can now somehow talk about it with my family and friends. Our group with Jed (behind us). Sorry some photos are blurry. 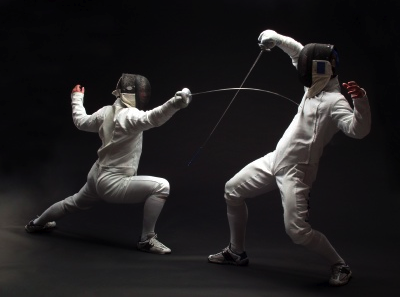 So, if you want to learn a new sport, why not try fencing? When it comes to the friendship department, I believe I am one of the luckiest girls on earth. Having had a bad time the week before, one of my best friends Katie surprised me with a weekend get away in Cardiff, Wales in time for our first half marathon together. While she could have chosen to celebrate her success (she just passed her exams) in some other way, she chose to spend it with me because she thought we both deserved a good time in Cardiff. And so we celebrated her success and my sort of failure with a view! Katie didn't actually told me that she booked us a five star hotel by Cardiff bay. She wanted to surprise me and she succeeded. The breathtaking view and Katie's kindness almost brought tears to my eyes. And what is the better way to carb-load than to sit outside your hotel balcony with your food and enjoy the magnificent view of the Cardiff bay and the sunset? At least two and a half hours of carb-loading over sunset later, we realized that we have eaten far too much carbs that we doubted our ability to run the following day. So after our trip to the spa, we hit the gym and burned some calories on the bike and then did some crunches. Believe it or not, but we felt so much better afterwards. Although we only spent a few hours in Cardiff on our first day and didn't actually explore the city, it was nevertheless a very enjoyable and memorable day. And it ended with a fireworks display at the bay. Sunday the 5th of October was our official race day. We woke up in time for the sunrise and boy, wasn't it so beautiful. This gave me hope that the weather would be good for our run. Although it rained on our way to the race area, it settled in no time. This was my second half marathon. And after all that happened after my first half marathon, I am really happy to have done the race with one of my bestfriends, Katie. Indeed, new memories were made. We also met with our other friend Hannah after the race. 1:37 is Katie's personal best. I know, that is crazy fast. I am so proud of her. I must admit, I really enjoyed the Cardiff Half Marathon. I was really glad that it was not that hilly. The only killer was the hill at mile 12. At this point it was really mind over matter. I stopped for 5 seconds but then Lighters came on and I was embarrassed because I knew that that was my angel in heaven telling me not to give up. My angel exactly knows when to poke me and remind me that I can do it. And because I knew that I only had a mile to go, I continued to run at a slower pace. The crowd was not that bad either. Nothing like Bristol or London, but it was good enough for me to go on. I got a lot of high-fives from kids which was really amazing! But my favourite part was when we passed by a nursing home and a few elderly patients were waving flags and cheering on us. I thought that was the sweetest. And 1 hour and 58 minutes (and a trip to the porta-loo) later, I crossed the finish line with so much pride and satisfaction. That day, I was not in competition with anyone but myself. I wanted to break my personal record of 2 hours and 28minutes from my first half marathon in Den Haag. And to be honest, I was only hoping to finish at 2 hours flat, but I obviously did better.